Photo by Brandon Fields. Courtesy of Borderless Studio. Join us for an evening of storytelling through performances, curated projections, and memories collection. 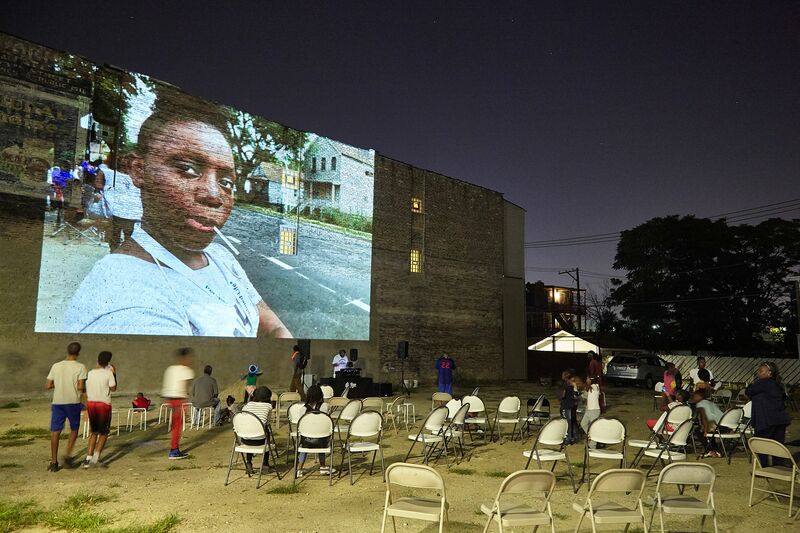 Curated visual projections during the performance depict Black life during the Great Migration through historic photos of Chicago and the South. A “memory station” will ask participants to share their stories related to their journey and belonging in Chicago. Stories will be shared in a gallery walk. Performances by Tonika Johnson and Roy Kinsey. Inspired by Langston Hughes. In partnership with RAGE (Residents Association of Greater Englewood, Borderless Studio, and Creative Grounds). This program is part of the mobile CitizenSHIP programming series and takes place in and around Chicago. The event is free. Registration is required. This event will take place at Woods Academy, 6206 S. Racine Avenue, Chicago, IL, 60636. Tonika Johnson is visual artist/photographer from Chicago’s South Side Englewood neighborhood, and co-founder of Resident Association of Greater Englewood (R.A.G.E.). She was featured in Chicago Magazine as a 2017 Chicagoan of the Year for her photography of Englewood’s everyday beauty, countering its pervasive media coverage of poverty and crime. Her work has been exhibited at Rootwork Gallery, Chicago Cultural Center, Harold Washington Library Center and Loyola University’s Museum of Art. Paola Aguirre is founder of Borderless Studio, Chicago-based urban design and research practice focused on cultivating collaborative design agency through interdisciplinary projects. Her work focuses on exploring creative and collaborative community design interventions that address the complexity of urban systems and social equity by looking at intersections between architecture, urban design, infrastructure, landscape, planning and civic participatory processes. She also an educator teaching at the School of the Art Institute of Chicago. Aysha Butler is co-founder of the Resident Association of Greater Englewood (R.A.G.E. ), and as longtime resident of Greater Englewood and is determined to uplift, inspire and change the perception of her neighborhood, which is often seen as a death trap. Butler has served on various boards and councils in Englewood including; Chair of the Education Task force of Teamwork Englewood, a community rep on the LSC for Robeson High School, member of the Englewood Community Cultural Planning Council, Co-Chair of the Englewood Community Action Council. Roy Kinsey is a musical and performance artist, and librarian in the Teen Services/Youmedia department for Chicago Public Libraries. Born and raised in Chicago, Roy has been featured in and on major local, national, and international publications like Billboard, NPR, WBEZ’s Vocalo, the Chicago Tribune, WGCI and the RedEye. His latest work exploring black queer identity and spirituality, premiered at the Museum of Contemporary Art, the Art Institute of Chicago, the Harold Washington Cultural Center and the DuSable Museum. To receive information on future exhibitions and events at Wrightwood 659, please sign up for our mailing list. We look forward to seeing you soon!